She's hiding something big. He's hiding someone small. Scarlet Crowley is the only freshman at Harkness College who had to sneak past TV news trucks parked on her front lawn just to leave town. Her name is as new as the shiny student ID it's printed on. The only way to survive college will be to conceal her identity, even if it means lying to the green-eyed boy she's falling for. Bridger and Scarlet form a tentative relationship based on the understanding that some things must always be held back. But when grim developments threaten them both, going it alone just won't work anymore. And if they can't learn to trust one another now, the families who let them down will take everything they've struggled to keep. I'm loving this series! I didn't know how this book was going to compare to book 1 but it seriously was just as good, if not better!! 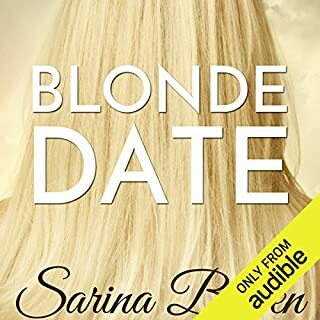 Sarina Bowen is great at seriously deep issues with a huge side of happily ever after! The issues these characters had to deal with were extremely hard but they both handled it so well I wanted to cheer for them. Bridger was so different than I thought he was after book 1. His character was amazing! Scarlet is such a tough girl, she had some seriously big things going on in her life and she just wanted to get away from it all and go to college but life only follows her. Together these two are so perfect, they are hot and in love! Can't wait to move on to the next book! The narration in this book was great too! She has a way of writing that makes her characters seem real. I wish we would been able to see Scarlet and Bridger's relationship develop more. It seemed like we only got to know them through the lens of their issues . Everything hinged so heavily on the drama unfolding and take over the romance. There's never a moment when it's clear why they are drawn to each other. The story did pick up pace again somewhere around the 75% only to face a rushed ending with some resolutions a bit too convenient. Also, if you are expecting some hockey in this book you are going to be disappointed. This is more college romance than hockey romance. But overall, yes, a good story. I loved the audiobook. This series has a wonderful pair of narrators. Both of them do an amazing job. It is very pleasing to listen to them. Everything about this audiobook is wonderful. Nick Podehl is a wonderful Bridger, and Saskia Maarleveld is fantastic as Scarlet. Totally worth it to listen to this audiobook. Pure Gold. That’s what this book is. The Year We Hid Away is the second installment in the Ivy Years series, and it is as good as the first one. 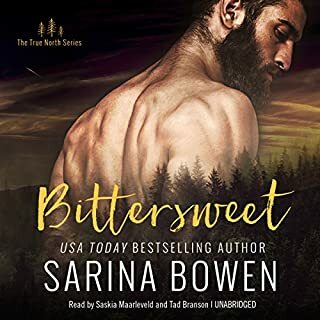 I’m completely in love with every book Sarina Bowen has written because I can’t get enough of her words. She has a way with words that fascinates me. Her style is wonderful, and her plots are usually very well developed. And I find really interesting that she tackles issues that are not very common in romance novels, like child molestation or drug abuse. But she does it with tact and sensitivity, and in a way that doesn’t alienate the reader at all, or turn the story too dark. But these issues are there, and make you think and feel. She doesn’t shy away from real life in any way. And in my opinion, that makes her truly special. This is the story of Bridger and Scarlet, and it is really, really sweet. It has plenty of drama on both their ends, but their relationship develops beautifully from friends to lovers, and their chemistry is really hot. Bridger is so sweet, and hot, and wonderful. He’s going through the worst year of his life and hiding all his problems from his friends, avoiding them and doing what he thinks is best. But he wasn’t expecting to meet someone special. Scarlet has her own secrets to keep, and is hiding in plain sight. Lying about who she really is, she tries to start a new life in Harkness College without the stigma of her family history. She refuses to open up to Bridger, choosing to fight her battles on her own. So when lies and half truths are exposed, they will need to trust each other and forgive mistakes to make their relationship work. As I said, I loved this book. It’s sweet, romantic and has plenty of heat. Bridger and Scarlet are very well developed as characters and the plot is perfectly paced and though out. It has many sources of drama and angst, and the secondary characters are pretty awesome, as always. I specially enjoyed little Lucy, Bridger’s 8 year old sister, and Andy, Bridger’s friend and neighbor. It is truly a beautiful book, very easy to read and enjoy, and pretty impossible to put down. 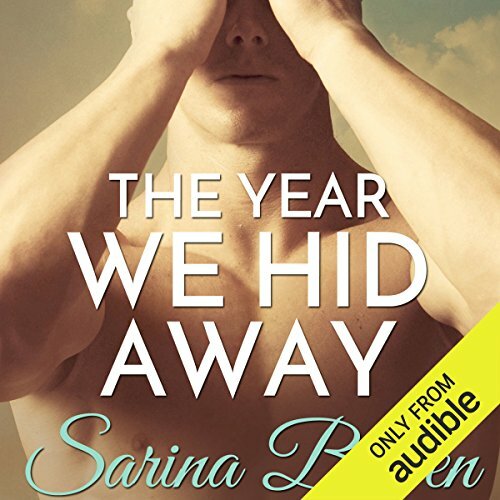 I absolutely loved the audiobook for The Year We Hid Away! Bridger and Scarlett were such wonderful characters, and handled the obstacles in the their lives. Nick Podehl and Saskia Maarleveld did a phenomenal job of bringing Bridger and Scarlett to life! This is definitely a re-listen for me!! Scarlet and Bridger each guarded troubling secrets they kept from everyone, including each other. Despite this, they built a sweet relationship that was a joy for me as a reader to experience. Their lives were so full of mess and complication that they could only steal snippets of time to be together and those moments became the highlights of their gruelling weeks. The build-up to the love is so natural and sweet that it was quite a delicious read. Scarlet and Bridger are admirable, loveable, tenacious, resourceful and loving people. Their story held several surprises and twists that added suspense and sometimes danger, making this one very enjoyable reading/listening experience. Very well told and heart-warming. I can't say enough times how much I LOVE these narrators. LOVE THEM, LOVE THEM. Some people manage to skate through their life with little to no drama and others seem to get everything thrown at them. I don't know why that is but the old saying - it's not what happens to you, it's how you deal with it - is very true. 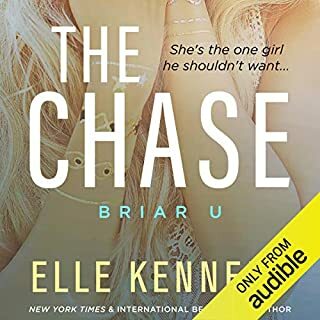 Bridger is a college hockey star who has a very bright future ahead of him when he has no choice but to remove his little sister from their family to be her sole caregiver. He has always helped look after her anyway but now he is responsible for providing for her in every way a parent would have. He is about to learn the art of juggling as he copes with his study requirements, a part time job, getting Lucy to school each day and hiding the fact that she lives in his dorm. He has no time for anything else in his life, including his beloved hockey. Scarlet is in her first year at college, desperate to make a fresh start. She plans on laying low, getting on with her work and enjoy the breathing space that being away from her home town and family now offers her. She may be away from the chaos for now but the issues in her family life keep knocking on her door. Her plan to keep to herself all year ends when she meets someone, the super cute and persistent Bridger. Initially she steers clear of him but he is either stalking her or they keep meeting by coincidence, or maybe it is fate? Bridger and Scarlet become friends. Both of them have secrets they are hiding from each other and the world in general but having someone you can count on is something they both need. Individually, they are going through some heavy stuff, things that have forced them to grow up and be projected into adulthood a bit faster than normal. It's amazing what you can cope with when you have no choice but to do just that. Everything they have to deal with brings them closer together and they find strength in each other. I loved Bridger, his dedication to his sister and how his sense of family was so important to him despite what his home situation was like. There is a lot happening in this story but it is also a journey of two people finding their first loves. LOVED IT SO MUCH!! ALL THE FEELS!!!! I loved this one, even more than book 1...I cried for Bridger and Scarlet...they both had secrets that were so life affecting..and to be so young...Both of them were forced into older roles before they should have been! I like how it turned out for them...and I hope they make it..and Lucy!! I love that little girl...we should all have a brother as good as Bridge!!! On to the Novella now...Loving this series!!! How much can two people endure? This book sent me on an absolute roller coaster ride of emotions ! Just when I thought I couldn’t take anymore things began to turn around ! Wow ! What a ride! A story about two people finding each other when they struggling with life the most. 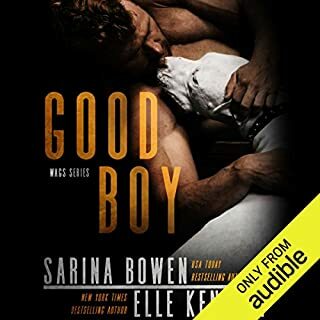 * I listened to audio book and it was clear voices with good pronunciation so it was easy to listen to. * It’s a story filled with feelings so it made me both laugh and cry. This was even better than the first book in this series so I went and bought book 3. 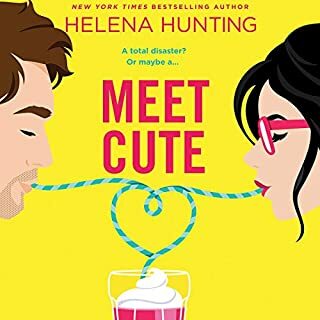 Solid 5 stars 🌟 if you love a good romance with a minimal amount of drama but very intriguing storyline. This story was so great. I really enjoyed listening and wish there would have been more!!! This was even better than the first book. I loved Bridger and Scarlet's story. It had plenty of drama plus a sweet developing romance with a HEA.